Eaton Vance has a long history in serving institutional clients and consultants. We offer a range of equity, income and alternative strategies tailored for institutional investors around the world including pension plans and financial institutions, Sovereign Wealth Funds and Superannuation Funds. A global leader in responsible investing, Calvert traces its roots to back to 1976. The firm is focused entirely on responsible investing, seeking superior performance through integrated ESG research with an emphasis on company engagement and the measurement of non-financial factors. For four decades, over the course of numerous economic and interest-rate cycles, Eaton Vance has been developing fixed-income strategies with an unwavering commitment to our clients' success. The Eaton Vance Multisector Bond Strategy offers exposure to a broad range of global fixed income sectors and emphasizes security selection using a bottom-up, value-driven style to seek excess return. A pioneer in floating-rate loan investment management, Eaton Vance launched one of the first loan strategies in 1989. More than two decades later, our time-tested pillars of floating-rate loan management - fundamental credit research and systematic risk-weighted portfolio optimization - continue to deliver intelligent market exposure for institutional clients. Calvert is a recognized leader with a proven track record in influencing positive change while delivering competitive investment results. The firm’s proprietary research focuses on integrated ESG research, rigorous analysis of non-financial factors, and direct company engagement. At Eaton Vance, our sole purpose is to manage investment assets—so we can focus on what our clients have engaged us for at all times. We are not subject to the changing priorities of a parent company with many subsidiaries. We make strategic business decisions that are good for our clients, not simply good for a larger entity’s bottom line. What is a bond worth? It is such a basic question that you wouldn’t think investors would change their minds so dramatically over the span of just a few months, in the absence of any significant change in underlying creditmarket fundamentals or interest rates. But that is exactly what happened in the fourth quarter of 2018 and the first quarter of 2019, when credit markets sold off and then rebounded quickly and sharply. Despite the strong equity market rally to start 2019, investors have continued to reduce their exposure to stocks. Given the current risk-averse positioning of many investors, the market environment that would likely cause the most pain would be for equities to move higher. 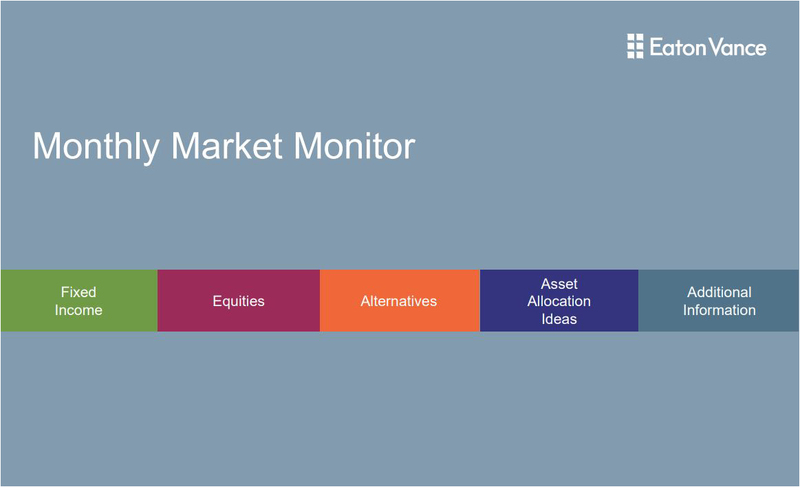 Our Monthly Market Monitor is an in-depth, single resource intended to encapsulate and provide a general review of overall economic and asset class data on a timely basis.